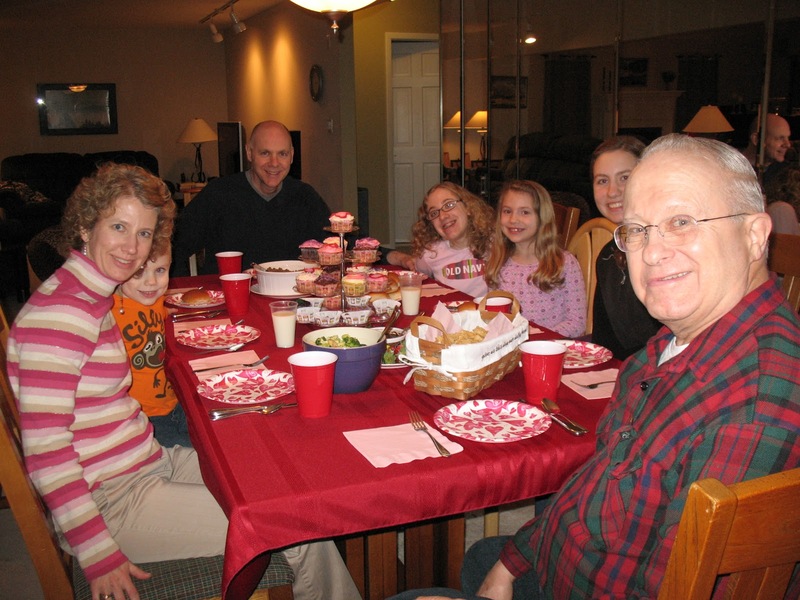 Around the Table Book: A New Year's Resolution: More Family Dinners! Once upon a time there was a busy family. They were busy with good things: Mom taught middle school full time, taught Sunday school, and had sewing classes for unwed mothers on Saturdays. Dad worked fulltime at a farm for former street children an hour bus ride from home and used his sixteen passenger van to transport his teens and others to Friday night youth group and other activities. The three sons were in drama, sports, and tutored after school. The two adopted daughters took extra English as a Second Language classes and spent as much time with friends as possible. No one would agree to sitting down together to eat and staying there for half an hour, would they? Does that sound like your family and your thoughts? "We were parents to five children and in our sixth year on the mission field when we first read Sharon's book, Around the Table. My husband and I read the book together prayerfully. We were utterly bowled over by its common sense and practicality. "It is not too dramatic a statement to say it changed our lives. We work with the urban poor in Bogotá, Colombia, and our home is centrally located to our mission and our children’s friends’ homes – in other words, the house phone, cell phones and doorbell ring nonstop seven days a week. "We personally knew the Flemings, a family, equally involved in ministry work, and saw how they put the brakes on everything for a precious time with family every evening. "Within a few days we completely changed our schedule and made the dinner hour an inviolable time. Three of our five children were teenagers by then so we braced ourselves knowing there would be some protests at such a drastic change. We were happily surprised to discover just the opposite – the kids LOVED recounting the day’s events, telling jokes, explaining what they’d learned in school and just being together… around the table." You might be surprised to see how your children adjust to having family dinner. I'm not saying it won't be without a learning curve for everyone, but I can guarantee you it will be worth it. Even one night a week is a huge start! What could you make to have dinner at home together tonight? If you have tortillas, cheese and some kind of lunch meat, make quesadillas! We like to set out a variety of foods--mushrooms, peppers, olives, meat, tomatoes, avocado, green onions, pepperoni, left over broasted chicken, etc. and let everyone prepare their own in a frying pan on low heat. Add plain yogurt or sour cream and salsa on the table for dipping. If you have eggs and rice have eggs and rice! Cook the rice. When it is done fry an egg for each person. Serve with cooked frozen veggies or orange slices. If you have pasta serve it with a can of spaghetti sauce or make up a white sauce and call it House Pasta Alfredo. Add a side of lettuce and tomato or lettuce and mandarin oranges. Don't wait until the time is perfect or the meal is gourmet, just sit down and eat together. To inspire you, I will be writing two posts a week, on Tuesdays and Fridays. Tuesdays will be a story designed to excite you about family mealtimes. Friday will be some practical help, like a recipe or menu, designed to help get you to the table. I hope you'll come visit every Tuesday and Friday and tell others where they can be inspired to connect with their families too! Kathleen continues today, ten years later, "Two years into emptynestedness, we still preserve our evening mealtime for ourselves as a couple. When we have guests our visitors are always surprised when we don't jump up to answer the phone in the middle of a meal. Around the Table is my favorite wedding gift for Christian couples." A great post and great pictures, too! We are very much into mealtime around here and my daughter and her family are, too. I am proud to say that she cooks a beautiful meal for them almost every week night -- weekends are for leftovers and cleaning out the fridge. Grampy and I usually share at least 2 meals together each day -- and we love it! Food and family really are a great combination. Thank you for the compliments! So glad you and your daughter continue the tradition. It's a great place for fun family time! Such a great message. Today with busy lives we just don't "sit around the table" enough. We are busy, but when the family's all here, we sit and sit and sit! This is a great resolution for everyone! Thanks for sharing. Thanks for stopping by. Hope you'll come again for inspiration to keep the resolution! Family dinners are the absolute best times! The family dinners with my daughters were some of the very best times, ordinary as they may have been (the dinners, not the daughters!). Thank you for sharing this post in the GRAND Social. They are great times, no matter if they are fancy or not--they are always special. Thanks for holding the social! Now it feels right sitting at the table all together. Love it! Lanaya, each stage is fun and frustrating! But enjoy them all. Thanks for holding the link up. We are all eating at the table again and I love it! Thanks for linking up to Raising Imperfection. So glad you are back at the table! Great to hear! Thanks for holding the link up. Great post! The focus is on food so people of all ages can relax and share their day and themselves. Great memories and strong family ties are just a couple of the benefits. As a children's minister this is one of the techniques I regularly taught busy parents and they were always amazed at the results. Thanks so much for linking on Busy Monday! Yes! It's such a great help to family life. We never held "family meetings" but we did always eat together and we still love to do it whenever we can and we are almost empty nesters! Never been sorry for all the work it entailed.